Last week was a good week for Dota 2 as Twitch channel dotastarladder_en takes the lead this week. The channel experienced a 398.1 per cent increase in views last week. Starladder1 is a close second after an even bigger increase of 458.7 per cent. Both channels racked up over 3.8 million hours watched in the last week. Third place goes to a random Russian channel that looks to be view botting, so that doesn't count. 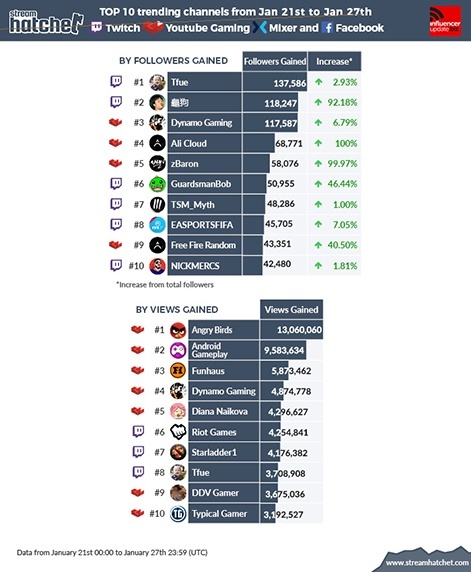 Fourth place goes to Riot Games' Twitch channel, which experienced a 25.4 per cent increase in views last week. Fortnite streamer Tfue is in fifth after another impressive 54.1 per cent increase in views. Summit1g is in sixth place after a 44.1 per cent rise in views. The Twitch streamer is still focusing on Sea of Thieves. Seventh place goes to another Russian view botter so we'll gloss over that one too. We'll also be weedling these cheating channels out of the chart from here on out. Eighth place goes to YouTube channel LoL Esports. The League of Legends channel had a 48.2 per cent increase in views last week. 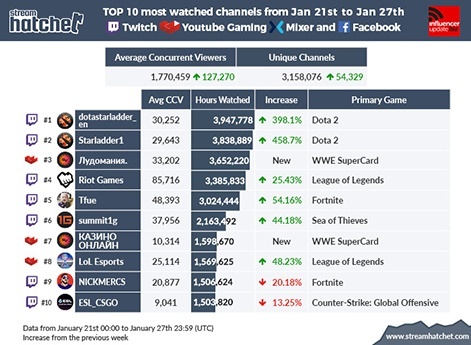 Twitch streamer NICKMERCS takes ninth place after a 20.1 per cent decrease in hours watched last week. Finally, Twitch channel ESL_CSGO brings up the rear after a 13.2 per cent decrease views last week. True is once again leading the trending by followers chart. The FaZe Clan member and Fortnite streamer is still racking up thousands of new followers a day. Dynamo Gaming is also rapidly racking up the followers, over 117.5k in the last week. Other entries on the followers chart include YouTube channel zBaron, a Brazilian channel that's somehow gained 99 per cent of its entire subscriber base in a week. Twitch channel TSM_Myth is also trending by followers, alongside fellow Twitch streamer GuardsmanBob. The Angry Birds YouTube channel is still leading the trending by views chart, presumably as it's still streaming Angry Birds episodes 24/7. Android Gameplay is in second place; the mobile-centric channel racked up over 9.5 million views in the last week. Other trending channels include DDV Gamer, Tfue, and chart favourites Diana Naikova and Funhaus. Dynamo Gaming is also in the trending by followers chart, meaning it has appeared in both.